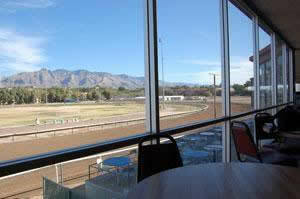 Rillito Park Race Track is rich in history. It's the birth place of Quarter Horse racing as well as the photo finish. Rillito has a 5/8 mile race track that hosts Thoroughbred and Quarter Horse racing several sunny weekends each year in Tucson, Arizona. In 1996 Rillito Park was recognized by the American Quarter Horse Association's American Quarter Horse Foundation as a Historical Marker. Over the years, famous horses including Shue Fly, Joe Reed II, Piggin String, Hard Twist, Queenie, and Miss Panama have raced at Rillito. Kentucky Derby winning trainer Bob Baffert's first Quarter Horse winner was Baron at Flagstaff, Arizona in 1971. His first Thoroughbred winner was Flipper Star on January 28, 1979 at Rillito.